Our Life at Home series continues with the topic of self-discipline. We have already begun to discuss the very important topic of self-discipline with regard to shopping and eating, and now we are looking at where we need it at home. Self-discipline is extremely important to have at home because at home we are our own bosses, we set the tone and no one (unless you live with your parents) is going to set it for you. Sometimes this freedom runs away with us. I believe everything boils down to needing self-discipline at home. It could be that you need self-discipline to not reach into the cookie jar all day long, or binge-watch reality TV. It could be that you need self-discipline with how you communicate to your spouse (otherwise known as biting your tongue) or with keeping your home office in order. Many of you expressed the desire to change how much screen time you use each week... this is where self-discipline comes in handy! 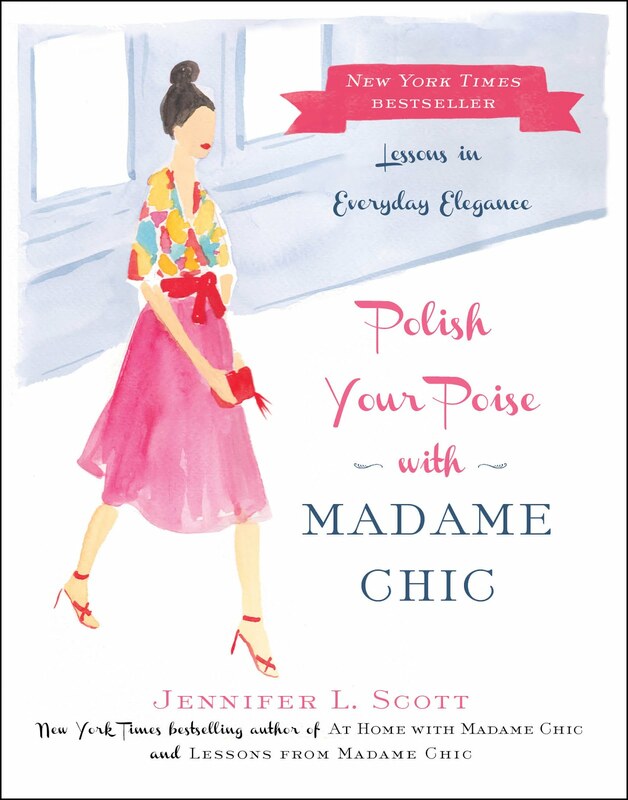 She is Little,She is Fierce blog writes of Lessons from Madame Chic: "this book is perfect. You need it STAT!" Tips on Life and Love recommends At Home With Madame Chic in their article: Clutterbugs, Beware: 10 Books for Organizing Your Home. Italian readers: The marvelous Edy Tassi, who translates the Madame Chic books into Italian, has written a blog post about At Home With Madame Chic on her blog. You can read it here. Practice self-discipline with the small things. This week, put your belongings away immediately after you use them. This goes for everything from the sugar bowl to the blow drier. Don't leave anything for later... with intention, put it away as soon as you can. Notice how this small change exercises your self-discipline muscle and will inspire you to become more disciplined in other areas of your life. I'm currently a 19 year old exchange student in Japan from Ohio, and the other day I saw this book in a store. I've always been interested in French culture so I bought this book on my Kindle. WORLD CHANGED. I've been incorporating these into my daily life and it's amazing what a difference it's made. I've been very homesick... This book has helped me turn my exchange around and given it a whole new meaning. I am truly grateful. Thank you! I hope you enjoy every moment of your exchange in Japan. 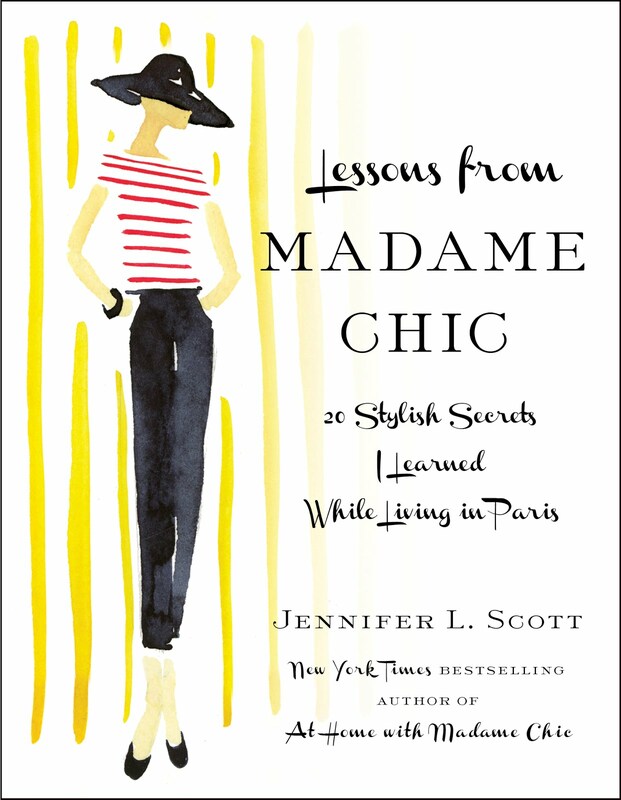 I am so happy to hear that Lessons from Madame Chic has inspired you in such a way. This week, by popular demand, I am sharing my drugstore beauty favorites with you. Often when I do my skincare and makeup posts, readers ask for drugstore alternatives to the higher-end, more expensive products. This week I am sharing a handful of my favorites with you. This drugstore facial moisturizer is such a find! After running out of my favorite high-end Eminence Age Corrective Coconut Moisturizer, I wanted to see if I could find a drugstore version that would compare. I have found it with this cream, which is very lightweight, and is priced at an extremely good value. This is a marvelous dupe for my favorite Epicuren fine herbal facial scrub, and is much more affordable. My only complaint is that the scent of the St Ives scrub isn't my favorite, but try it for yourself to see what you think. I've talked about this amazing lip color before and can't stop boasting about this gem of a find. The color truly lasts all day long and does not dry out your lips. Mulberry is the shade I recommend. Thank you to everyone who watched my Critics' Choice Awards red carpet fashion run-down last Thursday. What a blast I had with the entire Maker TV cast and crew! I am pictured above with host, Taryn Southern. The Epoch Times discovers the ten-item wardrobe in a very humorous way. The Neo-Trad lists both Madame Chic books as the Best Books for Francophiles. Don't worry if you do not have a big budget for skincare and makeup products. Contrary to what many women's publications will have you think, you don't need hundreds of products to keep up a beauty routine. Focus on clean and clear skin and a manageable le no makeup look and you will find yourself saving money and feeling inspired to appreciate your natural beauty. Also, for every high-end product you long for, chances are there is a less expensive dupe out there. Read reviews, talk to your friends and cultivate a beauty cabinet that works within your budget. Just a brief note to say that I followed your advice a few months ago and started eating lunch. As a teacher, this is generally impossible, but in so doing it has improved my quality of life 2 ways: bringing me a moment of peace and pleasure in a busy day, increased nutritional intake. I never dreamed I'd be listening to DeBussy's La Mer in the middle of the school day, but it is so nice. It's an island of calm. Thanks, again! Julia this is wonderful to hear. Your job as a teacher is so vitally important, I'm glad that you are taking the time to nourish yourself at lunch! This week I would love to know... what are your drugstore beauty favorites? Do you have any good ones to recommend? FTC: All items were purchased by me. I have no affiliation with any companies represented. As always, my honest opinion is used. We are kicking off the Life at Home series on The Daily Connoisseur this week with this first installment: Cut the Distractions. Living well at home is very important. It's important because how you live at home behind closed doors when no one is looking is indicative of your true self and your true values. We strive to make changes to our life in the areas of style, makeup, wardrobe, clutter, being in the present moment, presenting ourselves well, etc. and if we are serious about making these changes, we need to get serious about implementing them at home. In At Home With Madame Chic we discuss how a happy home life sets you up for success in the outside world. Order is needed at home. Organization is needed at home. Beauty is needed at home. Dignity is needed at home. The arts are needed at home. Style is needed at home. But are we able to live well at home if we find ourselves constantly distracted? In our minds we know what we should be doing but when we will actually get around to doing that? We're not sure. Right now we're surfing the internet, or binge-watching a reality TV show, or deep into reading Facebook posts. You'd like to cook that healthy meal. You'd like to get some patio gardening done. You'd like to write that letter. You'd like to practice the piano. You'd like to organize your lingerie drawer. You'd like to read that historical biography. You'd like to write in your journal. You'd like to tidy up the kitchen and you will... just after you spend an hour perusing the online shops. It certainly does to me! Screens- whether television, smartphone or laptop can be a major distraction and if we want to live well at home, we need to cut the distraction. This doesn't mean cutting these things out entirely. But it does mean getting strict about how much time you devote to them. MoonFireGypsyWagon muses on At Home With Madame Chic in her latest blogpost. If you have extra time this week, don't spend it on the internet (even if that means shutting down this blog right now! ), but try something that enriches your soul: play the piano, write a poem, get some gardening done, make a cake, write a letter, arrange some flowers. Feel invigorated by your freedom from the screen. Jennifer, I've been following your blog for a while now and love it. Love your videos. And yes, I'm adhering to your 10-item capsule wardrobe. It's so much easier and stylish with regard to ease of deciding what to wear. Almost everything in my closet works with everything else so no problem. My closet is now a streamlined and pretty personal space...one I'm happy to show to my girlfriends as an inspiration. The best news is Lessons from Madame Chic inspired me to put my best self forward even if I'm just doing errands or going to the supermarket. I feel so much better knowing I look presentable and need never again feel embarrassed upon meeting an acquaintance or neighbor while out and about. One of the very best compliments I've received as a result was from the mother of a good friend, Whenever I see you, Patricia, you always look so...so...clean and shiny. 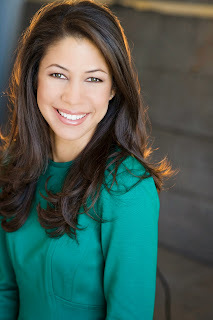 I was drawn into your video blogs not only by their content, but also, almost immediately, by the fact that I'd find myself smiling whenever I heard your intro, ... Jennifer here. Thank you Patricia. You have been a long-time reader and supporter of my blog. I appreciate your testimonial! Happy new year Daily Connoisseurs! It is great to be back on the blog. I hope you all had a restful break. 2015 on The Daily Connoisseur is going to be a very exciting year. We will continue to explore the concepts in At Home With Madame Chic on the importance of living well at home. We will elaborate more deeply on traditional connoisseur topics like the Ten-Item Wardrobe, etc. and we will also uncover new concepts that will enrich our everyday lives in magnificent ways. This week's video discusses the upcoming 2015 topics and shares the Christmas present I received from Mr. Connoisseur (you will have to watch the video to see what this one is!). I am so pleased to now share my wonderful news with you... The week before Christmas break I received my third book deal with Simon & Schuster! I have been working on this book concept for a few months now and am so thrilled to have received the go-ahead from Simon & Schuster. I won't discuss my work until I'm finished with it, but I can tell you that it will bring us even deeper into the Madame Chic lifestyle and will contain concepts that all readers can incorporate into their lives. We are hoping that the book will be released in time for Christmas 2015 (this year!). Thank you to my agent, Erica Silverman, and my editor, Trish Todd, (the Chic dream team!) for making this happen. At Home With Madame Chic is mentioned in Redbook magazine this month inspiring people to cultivate gratitude. I am featured on At Home With Cheryll and Sam's radio show discussing Madame Chic and the art of living well. BookGirlTV has featured both Madame Chic books in her annual gift guide. Thank you Tessa! (Her YouTube channel is wonderful, by the way, check it out and subscribe if you love books as much as I do). 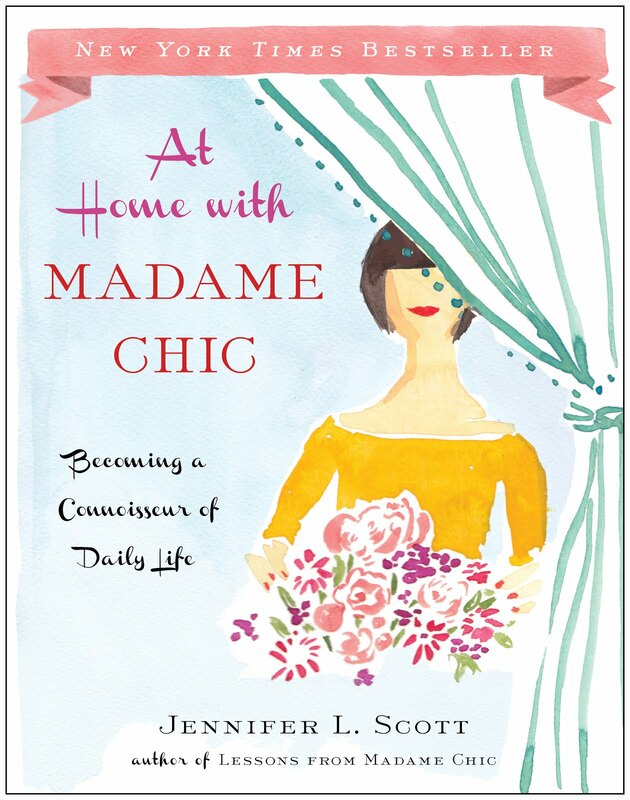 Rose of Books recommends At Home With Madame Chic for your new year reading resolutions. Mrs. Shockley of A Home For Elegance loves the affirmations in At Home With Madame Chic. What are your new year resolutions? Most people vow to eat healthier, lose weight and exercise more. These are great aspirations, but I also encourage you to strive to improve your life in a even more meaningful way. Commit this year to changing yourself for the better: to be present, stand firm with your values and to not be swayed by what is popular, but by what is important to you and your heart. Resolve to be an even better version of yourself this year. I will be there right along with you. I wanted to thank you so much for all that you have done by writing your books and sharing your life with everyone through your blog. I am a thirteen-year-old girl living in Maryland, and your blog and books have changed my views on life. I have turned my closet into a 10 Item Wardrobe and read your first book cover to cover. I just asked for and received "At Home With Madame Chic" for a Christmas present, and it was definitely one of my very favorite gifts! You are such a great role model for women and girls everywhere. All of the ideas about living have inspired me do do things that I would never have done otherwise. I de-cluttered my room, I wear my nice things always, and always have a refined and positive attitude. Thank you again and have a Happy New Year! I wrote Casey back privately to thank her for her kind email but wanted to share it with you here on the testimonials to emphasize how life-changing The Daily Connoisseur concepts can be. To hear such an articulate and inspiring email from 13-year-old girl makes all the work I do worthwhile. Thank you Casey! Please leave me a comment below with any requests you have for the new year. The most popular and heavily requested topics are the ones I will strive to address first so don't be shy and let me know what you would like to hear on The Daily Connoisseur this year.